Today turned out to be more exciting than I had planned on. After getting to bed late last night, I woke up around 1pm today (which certainly was welcomed). I then had to finish reading my novel for writing class. Finished reading at 4pm, and I certainly didn't want to waste the rest of my day. So, I hopped on the bus and I was on my way to Fiesole. This public Transportation is really beginning to grown on me. When I realized the bus was climbing up the mountain, I knew I was going to like Fiesole. As soon as I got off of the bus, I could feel an immense difference compared to firenze. Less tourists, higher elevation, and much more quaint. Also, the majority of people I saw were higher up the age bracket as well as the financial bracket. I definitely wasn't in the "bad part of town". What this meant to me? I felt much more safe walking around there alone compared to firenze, even though I feel relatively safe most of the time. I highly suggest you check out that photo in the super high resolution it deserves to be seen in. It will take long to load since it is such a large image, but click here to see the full resolution. And lastly, this photo needs a little background story. As I was walking towards the bus stop, I heard all of these air horns blasting off. As I followed the sound, I heard music and people cheering. I peered around the corner and what was it but a wedding! 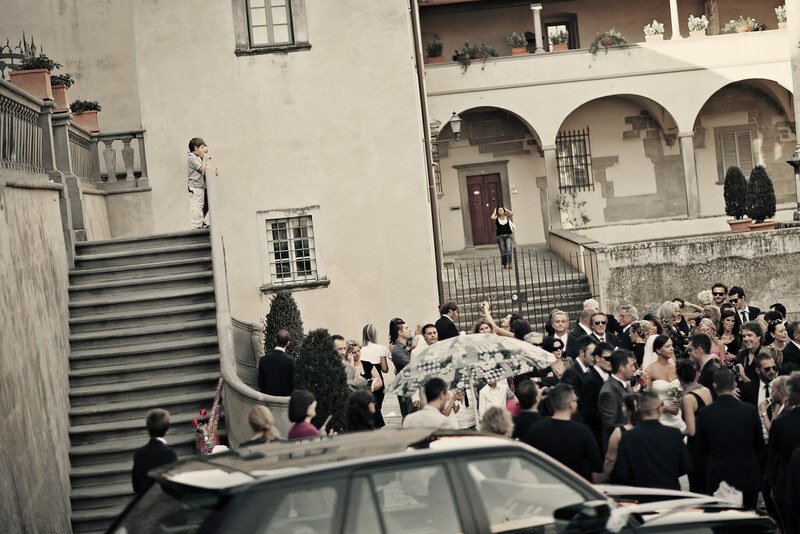 How great it must be to have a wedding in Italy! Everyone was so happy, cheerful, and full of energy. What I found interesting though, was the little boy peering over the edge as if he's overlooking the entire celebration. There's just so much going on in the photo that I ended up being able to pick out numerous things in the photo that I didn't even notice in person! I sat down and watched their celebration for a little bit, then I hopped on the bus and was back on my way home (it's weird calling it home, but it is starting to feel right). The rest of the day was relatively uneventful. I edited the pics you are seeing here, and that's about it. Tomorrow I'll have to finish up my homework, then back to class for a few days. If you haven't already looked, check out my flickr to see all of my photos since I don't always post every photo here. Hope you enjoyed reading and check back again! I'm an aspiring pre-med student currently attending F&M with an intense interest in photography, among other things. From August 28 - December 16, I will be studying for a semester in Florence, Italy with a program through NYU. First Week of Classes Complete!